Calling all teens! Come learn some very valuable basic repair and maintenance tips for your vehicle. We will use the first two enrollee's personal vehicles to demonstrate while we learn about fluids, tire pressure, dash lights and what they mean and how to change a tire. Cost is $5 each and you can sign up by calling +1(309) 782-8631. Lastly, once your ride is tuned up and detailed make sure to grab a $20 preloaded car wash card and we'll load an extra $5 on there for free to keep your wheels shiny looking all month long. 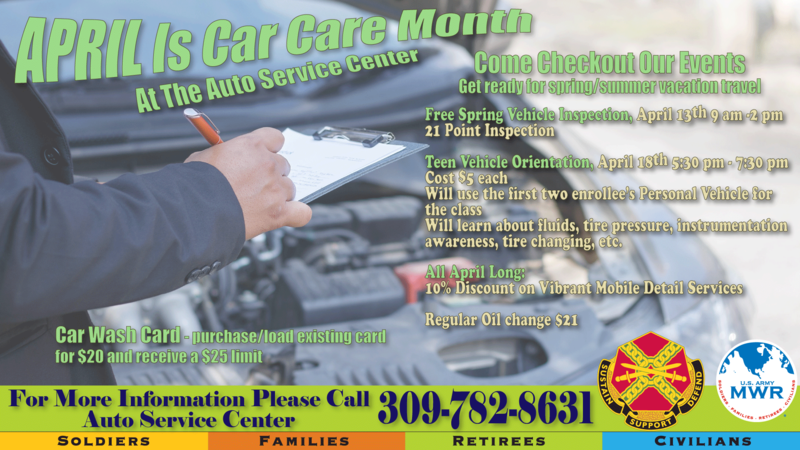 For more info please call the Auto Service Center at 309-782-8631.